Brain Injury CAT Scan or CT is the primary neuroimaging technique in the acute evaluation of the head trauma patient. Brain injury CAT scan or CT imaging uses a computer to digitally create an image based upon absorption of X-rays through the brain. From these images the Radiologist can see is there any abnormalities. He will relay his findings to the attending physician or to a neurosurgeon. This should be done routinely in a serious accident. The faster the results of the brain injury CAT scan are obtained, the faster treatment can begin. Detectors positioned around the head collect readings from multiple angles. The scanner then reconstructs an image of each slice. Then the images are compared to a normal brain CAT scan. This is how brain injury is detected. The CT scan is fast, making it preferable to MRI for acute cases as surgical intervention decisions must be made quickly. CT is available in almost all hospitals. CT can be done without removing the patient from IVs or other ICU equipment. 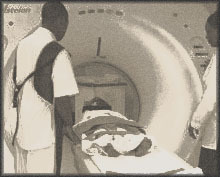 In contrast metal devices must be removed before the patient is exposed to the MRI magnet. CT does a good job of identifying brain bleeds and the effect of swelling. CT, as it uses X-ray, is better at seeing most fractures than MRI and because of its computerized analysis, superior to X-ray. CT is more sensitive to most life threatening conditions than other imaging techniques in the first 72 hours. CT scans are a structural test and do not see axonal injury, except in the most extreme cases. CT has poorer resolution than MRI. CT scans have little post acute value after swelling has gone and the blood from bleeds have been reabsorbed.